« First Principles, Clarice. Simplicity. 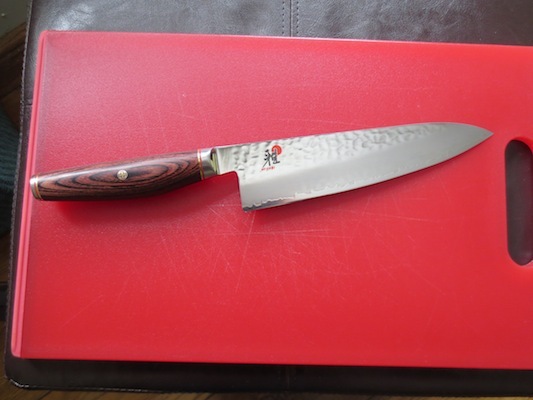 The Miyabi Artisan looks more like jewelry than a knife! I will admit, knives still make me nervous, although the demonstration you put us through last year (the knife slicing the tomato on its own was AMAZE-BALLS) did make me believe I could actually enjoy using a real knife. Give it a few more years and a few more get-togethers, and all you fellow E-hoes may make an actual chef/cook-type person out of me yet! With cutlery (as with jewelry and sports cars) looks can definitely matter. Of course with knives and cars one can argue whether the form or function is more important, depending on what one plans to do with the object at hand. That’s probably less important with jewelry. At any rate, the artisan is no Shigefusa! For whatever reason, I’ve never been a fan of knives getting hammered. Er, I mean, that hammered look/faux damascus. For some reason it makes me think the knife is going to be more brittle, even if that’s not true at all. I And it reminds me of those hollow-ground numbers that say it’ll release the food easier, but really doesn’t make a difference. I have a Togiharu 240mm gyuto, this guy, which I like specifically for the length (giggity), so I’m with you on the marketing gimmicks. 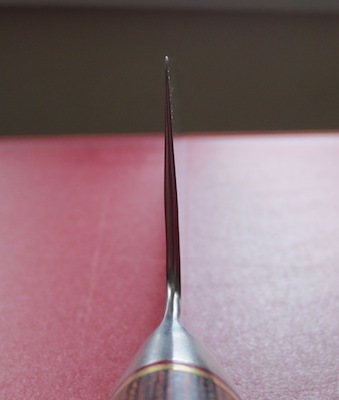 That said, the Togiharu looks like it has a pretty nice profile. How do you like it? Wow, what a beautiful knife. I agree with the previous reviewer about the hammered look though. Seems odd. I still haven’t ventured into the Eastern style knives. 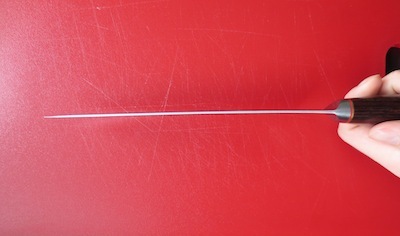 Does the blade being sharp on only one side cause the blade to bias toward one side or the other when cutting? And how does it hold up under normal wear and tear? My fiancé doesn’t use quite the same level of care when handling our current knives. The blade on this one is sharpened on both sides (if I remember correctly, Miyabi typically does a 70/30 bevel as opposed to a 50/50 on most of their knives). I haven’t noticed any steering while cutting with it (ditto for the Miyabi fusion). Normally only traditional Japanese knives like the yanagi and usuba are actually single-beveled. As for care, it’s generally pretty sturdy. Both the blade and handle should resist things like humidity or getting left with water or food on them (although with the latter you’ll definitely want to avoid highly acidic or alkaline stuff being on it for any length of time). SG2 is a high-hardness steel, so it can hold its edge for a long time, but is prone to chipping rather than dulling. I would absolutely not do things like cut on a glass or ceramic surface, store it loose in a drawer without a blade guard or sheath of some kind, and definitely no dishwasher. Any of those things could chip the blade and the heat of the washer could also damage the handle. I like how the blade of Miyabi Artisan gyuto looks like. My concern is the shape of the handle, I think, the top knife in your comparison picture have the stronger grip compared to the handle of Miyabi Artisan gyuto. 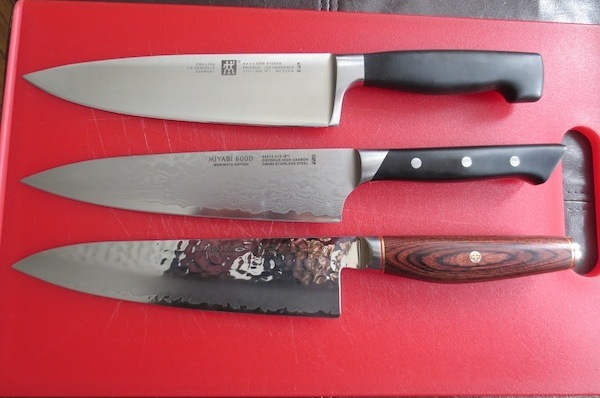 More often, I am considering the shape of the handle because for me, comfortability in using knife can make me do more slicing jobs with ease. Is the handle made up of wood? First off, apologies for the late reply! The handles of the Miyabi Artisan knives are made of pakkawood, that is they are made of layers of resin-impregnated wood fibers (in this case cocobolo wood). The end result is a material that looks like wood but is more durable and is highly resistant to common kitchen dangers like water damage that might ruin a normal wooden handle over time. 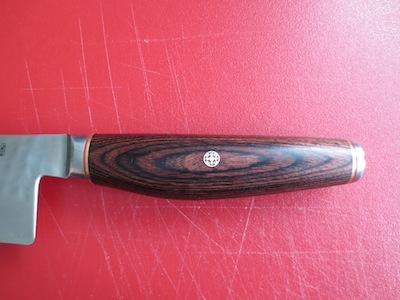 I found the handle on the Artisan pleasantly (even surprisingly) comfortable overall, although as I mentioned above, the knife’s balance is a bit handle-heavy for my general preference. This probably has much more to do with the metal end-cap than the handle material though. anybody else notice that this is a re-stamped Shun Premier series? The blade profiles are actually slightly different, so it’s not exactly the same thing, but Miyabi is definitely imitating the aesthetics of the Shun Premier with this particular line. Togiharu has a similar blade aesthetic in their hammered finish line as well, but with a western handle instead of the oval.